They thought the state governments were too weak. They believed that a weak central government was ineffective. They wanted a plan of government made up of two branches. They opposed the Northwest Ordinance. 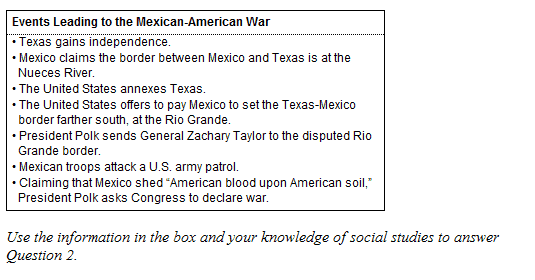 Which event was not a cause for the Mexican- American War? 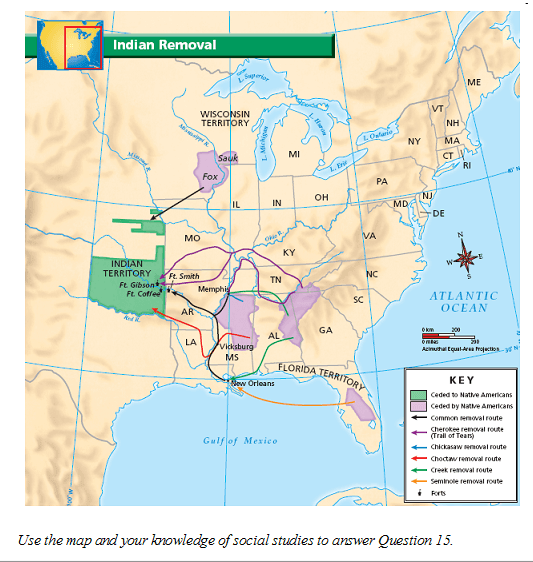 Texas being annexed by the U.S.
Use the information in the chart and your knowledge of social studies to answer Question 3. Smaller states wanted a weak executive. Smaller states preferred to keep the Articles of Confederation. Smaller states feared they would not have enough power in the new Congress. The judicial branch may not declare an act of Congress unconstitutional. The federal government is divided into legislative, executive, and judicial branch. The term for a senator is six years. the central government to pass new land ordinances. state governments to print more money. government leaders to revise the Articles of Confederation. Congress to give itself greater power to tax its citizens. a documented map showing a new route to the Pacific Ocean. the British in the Northwest Territory were allies. he did not want the United States to develop entangling alliances with foreign nations. France was too weak to aid the United States in battle. Calhoun's claim that a state had the right to nullify a federal law. European goods were more available. Jackson and Calhoun's decision to support a high tariff. The acts made it a crime for anyone to write or say anything negative about the federal government. It strengthened the political divide between Federalists and Democratic-Republicans. Under the acts, the President was not permitted to deport any alien he considered dangerous. Both A and B are correct responses. Hamilton and Jefferson generally agreed on the size and scope of the federal government of the United States. Hamilton wanted a strict interpretation of the U.S. Constitution and Jefferson wanted a loose interpretation of the U.S. Constitution. Jefferson favored a strong central government while Hamilton favored strong state governments. Jefferson favored a strong state government while Hamilton favored strong central government. New England states left the United States. The border between Canada and the United States was redrawn. The United States won its second war for independence. The United States agreed to remain neutral in European wars. European countries could not colonize in North and South America. The U.S. would not interfere in European conflicts. The U.S. would not be involved in European internal affairs. European countries could continue to develop colonial empires with U.S. permission. he did not have the constitutional power to buy land from another country. he worried about angering farmers who shipped their crops to New Orleans. he did not trust Monroe and Livingston to make a favorable deal. he worried that the land in the territory would be of poor quality. encouraged new settlers to come north on barges and steamboats. was a barrier protecting them from Native American attacks. allowed them to ship their crops to market in New Orleans. 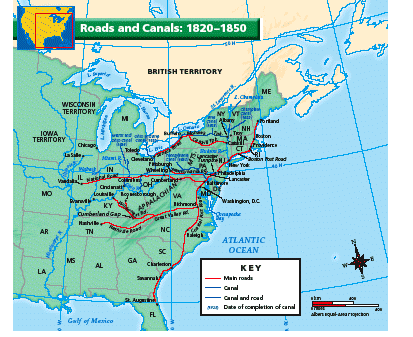 blocked the westward expansion of the United States. needed to establish a national bank. should not be responsible for paying off foreign debts. Constitution is the Supreme Law of the Land. Constitution must be followed when in conflict with other laws. Judicial Review is not supported by the Constitution. Judicial Branch can declare laws unconstitutional. The United States recognized the Mexican border at the Nueces River. The United States paid Mexico $10 million for land in Arizona and New Mexico. Texas gained independence from Mexico and became a republic. Mexico ceded a large area of territory to the United States. The progressive movement established women's suffrage, which is the right to _____________________? They had to ford many cities. They had to cross the Appalachian Mountains. They had to cross the Mississippi. They supported the abolitionist movement because it would hurt the women’s rights movement. They were against the abolitionist movement because they feared that former slaves would take their jobs. They welcomed the abolitionist movement because it meant that more men and women would vote in elections. They worried that the abolitionist movement would result in overcrowded schools. 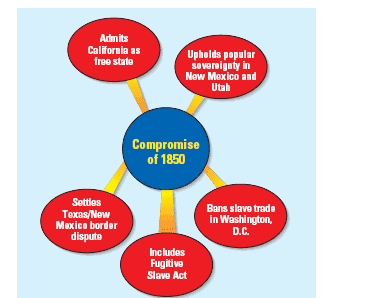 Which part of the Compromise of 1850 shown in the diagram was most likely demanded by southern members of Congress (8.1.8)? To save the Union, Southern leaders agreed to support the new President. Southern leaders called for a new presidential election to be held in the spring. Which of the following was a point made in the DREDD SCOTT decision (8.1.21)? Slaves were property, even if hey lived in a free territory. Regional attitudes toward slavery played a small role in the outcome. Moderate voters who wanted a compromise on slavery determined the winner. Regional attitudes toward slavery directly affected the outcome. National unity led to a landslide victory for the Republican candidate. supported the idea of popular sovereignty. gained support that helped him defeat Douglas for the Senate in 1858.
insisted that any new territories be kept free from slavery. 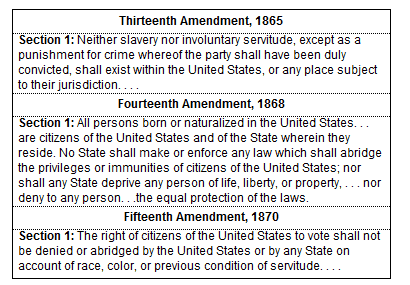 supported the Fugitive Slave Act. was proposed by Abraham Lincoln. supported the ideas outlined in the Compromise of 1850.
was well received by Canada. introduced the idea of popular sovereignty. Use the graph and your knowledge of social studies to answer the following question. According to these graphs, what effect did the Civil War have on the North and the South (8.1.27)? The Confederacy lost a majority of the key Civil War battles. 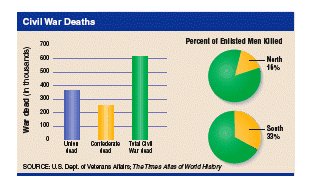 The Confederacy suffered the greatest share of the dead overall during the Civil War. The Union suffered more casualties but lost a smaller percentage of its fighting force. Ulysses S. Grant was made commander of the Union Army. the North and the South realized that the war would be a long, hard struggle. Lincoln realized that the war would be even shorter than he had thought. Thousands of southern men were killed or returned home disabled by wounds. Confederate money was useless, banks closed and many people lost their life savings. Which of the above amendments guaranteed equal protection of the laws? The South had excellent military leadership. The North had a larger population and resources. Factories were a significant advantage for the North. Men in the North were fighting to maintain their "way of life."